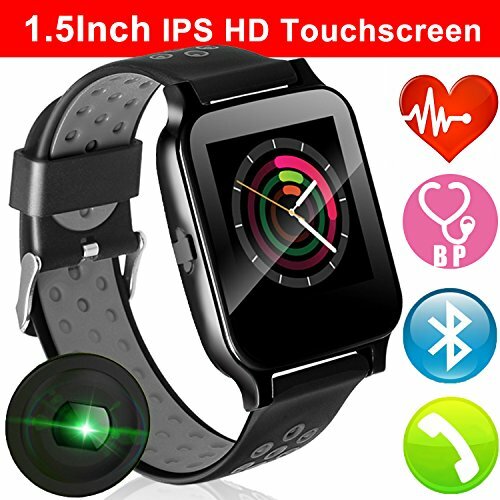 2018 NEW 1.55" IPS Touchscreen MTK2502 Smartband for IOS and Android. Elegant smart assistant more and rich function brings you the convenience of life and keep you fit. * Voice Control: Siri Voice assistant, let him dial, send message, or guide for you. Step 1: Download the app by scanning the QR code on the watch, or search the keywords "LEFUNDEVICE" in the google play or Apple Store. ⌚️2018 Upgraded Sport Smart Band Bracelet: Built-in 3G-axis motion sensor, 24/7 monitoring and record your real-time Heart Rate, measuring Blood Pressure, then sync all sports data to your smartphone. Allow you better to maximize workouts. Also accurately record all-day activities like steps, distance, calories burned, monitoring sleep quality. Sedentary reminder if you sit too long. Work as a good sports tracker. ⌚️Intelligent Watch & Personal Assistant: Built-in CPU MTK2502, wider Compatible with iPhone Android. 2018 new wristwatch with IPS 240*240 Super-Definition screen, show you more data clearly even in the glare. Bluetooth 4.0 connect the smartwatch, you can Dial & Answer the call, Siri Voice assistant and play music, camera control, Call / Message /app news Reminder and read (QQ, Micro letter, Twitter, Facebook, Whatsapp, Skype). Make your life more convenient. ⌚️3 UI Fashion Bluetooth Watch: Built-in 3 fashional clock faces, Just need to click to switch what style you like. 1.55" HD color screen with full lamination. Luxurious materials with super light stell cover, comfortable wearing with no sense of weight. Medical grade strap soft with dual colors, its adjustable watch strap to any size length you want to fit your wrist.hen you are sitting too long. Work as a good sports tracker. ⌚️Multifunction Fitness Watch-Date and 12/24H time display, Daily Sports Mode, Anti-lost alert, Find Phone, Drink water reminder, Pedometer, Running, Climbing, Ride, sports, Calories, Sleep monitor, Alarm clock, calendar, stopwatch, calculators, Image view etc. Great gift for Fathers, men, women even kids. Lifetime Warranty & USB Charge Directly: Comes with a 1-month hassle-free return,3-month free replacement and 12-month warranty. Built-in USB plug, No charging cable needed making it very convenient to charge with any USB block and computer.